You write great content. You put in your time and effort to research and solve problems. All the content you produce is helpful, original, and packed full of tips and valuable advice. This is awesome! You should definitely be proud of your work. However, do you rank? What position are you and your content on Google web searches? If you do not rank well, you will have a hard time improving your traffic stats. 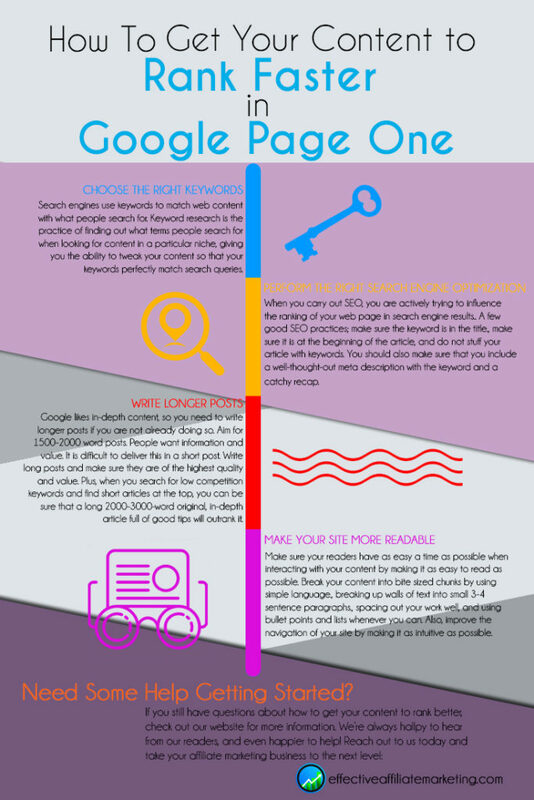 This is a guide on how to get your content to rank faster in google page one. If you want your content to rank well, simply follow these steps. What is a keyword? In the context of web content, a keyword is a word or a group of words that help describe the content of a web page. Think of keywords as shortcuts or the summary of the entire content. Search engines use keywords to match web content with what people search for, called search queries. Keyword research, therefore, is the practice of finding out what terms people enter into search engines when looking for content in a particular niche. What makes keyword research valuable is the fact that it grants you the ability to tweak your content so that your keywords perfectly match search queries. This is why keyword research is extremely important. When doing your keyword research, you need to choose low competition keywords that have traffic. These are referred to as long tail keywords. Keyword competition determines how difficult or easy it is to rank for a particular keyword. This competition depends on how popular the keyword is and the general niche competition. As a rule of thumb, the more popular a keyword is the harder it is to rank for it. This is why we go for low competition keywords that have traffic. For example, a keyword phrase like “shoes for women” is a very high competition keyword. If you were to get to page one, you would get an estimated 4795 searches per month. But this is a competitive keyword based on the QSR results. Chances are that with a new website, you probably will not make it to page one if you targeted this keyword. You could write the most awesome content, but your chances of it getting read will be slim. On the other hand, “extra wide women’s shoes” is a low competition keyword. Further more, this long tail keyword has excellent search volume. Most low competition keywords will not have a lot of search volume. Do not worry if the search volume is low. Your article will still rank for other keywords naturally. You need a good keyword research tool. I recommend Jaxxy. My criteria on Jaxxy are search volumes over 30/month and a QSR of less than 50. In Jaxxy, QSR stands for “quoted search results”. This is the number of competing websites on google that are competing for this exact KW. This a great indicator of competition. If you don’t want to use Jaxxy (I highly suggest you give it serious consideration), you can do this manually for free. It takes a bit of work but it can be done. Let me show you how. Now click on page 10. You will see this returned. Notice that the last page displayed is page 6. Click on it! Now you can see that the results for this quoted search is 52. You can also see the explanation of why it went from the original 25,100 results in our first search, down to 52. Google was showing us duplicate entries and entries that were not as relevant. Now you may ask why is Jaxxy showing a QSR of 45, while Google has 52? The answer is that Jaxxy goes even further in digging through the results and gives us an even more realistic expectation of traffic. The truth is that a difference of 7 potential visitors in one month is not that significant. I would rather do my planning based on conservative numbers anyway! Search Engine Optimization (SEO) is essential if you want your content to rank highly. In a nutshell, search engine optimization is any activity that helps improve your search engine rankings. When you carry out SEO, you are actively trying to influence the online visibility and ranking of your website or your web page in the search engine’s organic or unpaid results. Organic unpaid results are the best kind of results to rank highly for because you get to reach a wider and more relevant audience for a much longer time. When carrying out your SEO, you need to make sure the keyword is in the title. Also, make sure it is at the beginning of the article. A common mistake that many people make is stuffing their articles with keywords. Never keyword stuff. Instead, use the keyword naturally and make sure the content flows naturally. The only thing you need to do other than including the keyword in the title is to make sure it shows up in your intro. The sooner in your intro, the better. Improving user engagement with your content. When your content is good enough that people are driven to comment and interact with it in various ways, it gives a boost to your overall ranking. Search engines love content that people have found useful. These are the sorts of content that get recommended to even more readers through search results. Similarly, your ratings, comments, and reviews all work in the same way to give a boost to your search engine rankings. When people comment in your posts, for instance, Google’s web crawlers crawl the comments for other relevant keywords and rank your content even higher. Improve your site speeds. People get bored or annoyed with sites that take forever to load. When this happens, you lose readers to bounce rates. Search engines record your bounce rates, and if it is really high, your ranking will suffer. Once you have figured out what your keyword is and optimized your content, you need to focus on user experience. One of the main user experience issues that you need to take care of is the length of your content. You need to write longer posts. From personal experience, I have learned that Google likes in-depth content. I can confidently say this because my best performing posts are also my longest. When you write, aim for 2000 word posts. The days of 500-word posts or less are long gone. People want information and value. It is difficult to deliver this in a short post. Write long posts and make sure they are of the highest quality and value. If you are researching low competition keywords and you find short articles at the top of the SERPs, you can be sure that a long 2000-3000-word original, in-depth article full of good tips will outrank it. Take advantage of this and be the one who creates that long article to fill the gap. Most Newsworthy information: the who, what, where, when, why and how. When you organize your work in this way, it is difficult to run out of useful content to write. Start with the title, and arrange the body of the article according to the inverted pyramid. Do the same with your subheadings and subtitles, throughout your article body. What is the most newsworthy information about it? Are there any other important details? Finally, end with general information or calls to action. When you create longer posts, make sure you integrate images, videos, and infographics in your text content to make it more interesting and interactive. High-quality images have been proven to greatly increase user engagement. Since a picture is worth a thousand words, having an image that summarizes the central idea of your content will grant you a much-needed boost in your search engine rankings. Furthermore, images with proven engagement in a particular niche also help your site to rank well in google image search results. If not for anything else, simply just use images to treat your readers, because everyone likes pretty images. This is another essential user experience tip. Your readers need to have as easy a time as possible when interacting with your content. A huge part of this is making your content as easy to read as possible. You need to use simple language. Break up chunks of text into small 3-4 sentences max paragraphs. Increase your use of white space by spacing out your work well. Use bullet points and lists whenever you can. The idea here is to break your content into bite-sized chunks for the convenience of your users. Similarly, you need to improve the navigation of your site. Make it as intuitive as possible, such that even people who have never visited your site instinctively can tell where to go to find what. Use simple themes and designs. Make it minimalist and clean. Do not clutter your web pages with competing content and images that can overwhelm your visitors. Make sure you do not use popups on your site. Besides interrupting your visitors’ reading experience, they can be very annoying and make you appear cheap, and not in a good way. Furthermore, people hate them with a passion, and many users will immediately leave your site one a popup window shows up. I put together a cool Infographic that pulls it all together. I hope you like it! This is the surest way to get your content to the front page of google search results every time you post. As I said earlier, you have to be patient and keep at it before you see results. But if you follow these simple steps, you will eventually start to see results and before long, you will benefit from increasing free traffic. This free traffic will be the lifeblood of your business. The more you have of it, the more successful you will be. Do you need more help with affiliate marketing? If you found this article helpful, I would like to recommend a complete affiliate marketing program/community that can greatly improve your chances of making money online. It is the same program that I use for my affiliate marketing sites. In fact, it is that very same training and tools that allowed me to launch this site that you are on right now! It is a complete blueprint with step-by-step directions (with videos), in the exact sequence you need to implement them. There are tools to help you carry out the most complex tasks with the stroke a few keys. I wrote a comprehensive review for you. Please check it out as I am confident that it will help you be successful in your affiliate marketing business. Best of all, you can test drive it for free! CLICK HERE FOR MY #1 RECOMMENDED AFFILIATE MARKETING RESOURCE REVIEW! I hope you found this content helpful. I tried to make it as actionable as possible with step-by-step screenshots. If there is something else you want to see or if you have any questions, please let me know in the comments section below! I will get back to you ASAP. I enjoyed reading your article. I am impressed on how you made this easy to understand. I am a blogger that has a website for 1 month so I needed that strategy. I just have a question, can you explain more what that inverted pyramid is? Sometimes I have trouble writing long content so I really need that advice you are saying. Another is thank you for explaining Jaaxy to me. I have always been wondering about that QSR and I am glad to found an answer from you. Also, now I can make sure that I can use jaaxy better. greater than 30 searches and less than 50 competition. Just a question though. How about the SEO in the right most part, what number do you prefer on those. 80+? I am glad you enjoyed the post. To answer your question, the inverted pyramid method is a good way to structure your articles and posts. Essentially, you provide your readers with the most important and useful content up front. This covers the who , what , where, when and why. Next you go into supporting important details and finally general information relating to the subject. This allows you to communicate the most significant information right away. It also allows you to expand on a subject as much as you want. The SEO metric in Jaxxy is an indicator of how likely you are to rank on page one for a given KW. I like to stay at around 80. These tips are gold. I really like these and use most of them. I think my one favorite was checking google for how many competitive pages there would be. I will definitely have to keep that one in mind! Thanks! I’m so glad I clicked onto this post, I loved reading it and learn’t more than what I already new, everything was so easy to understand and simple. Will definitely be taking on this advise and using this for my own website. Hi Alyssa! I am glad you enjoyed the post and found that it was helpful. Just pply the advice in the post and you will not be disappointed!